Welcome to CAMDON MUSIC'S OFFICIAL WEBSITE! We are committed to providing music from today's hottest upcoming gospel artists & choirs! 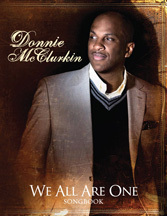 As well as providing sermons, songbooks, and literature from Pastor Donnie McClurkin! Please explore our site and WATCH for upcoming releases from Andrea McClurkin-Mellini & Nancey Jackson-Johnson! And don't forget to check out 'We All Are One the Songbook' & Donnie McClurkin's Biography 'Eternal Victim/Eternal Victor'.